Even in the world of the shiny new Apple iPad, Amazon has just declared that Kindle has become the best selling item in their history. For years, Harry Potter remained the best selling product and Kindle has just ousted Harry Potter as the best selling product in Amazon’s history. Even though the iPad has seen tremendous success in the first few months of it’s launch, it goes to prove that people are still interested in buying dedicated e-book readers. 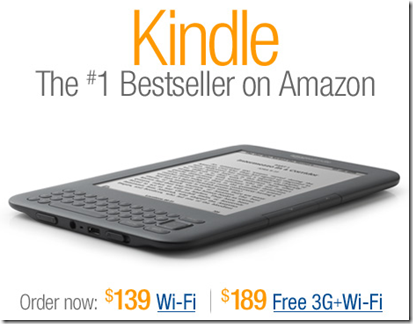 We’re seeing that many of the people who are buying Kindles also own an LCD tablet. Customers report using their LCD tablets for games, movies, and web browsing and their Kindles for reading sessions. This fact is very interesting as I can personally attest to the fact that having an iPad like tablet that does everything like a computer (almost) is kind of distracting. I have several books on my iPad but I hardly read them as things like reading news, viewing photos, twitter, etc. distract me anytime I pick one up. As many shoppers are doing, even if they own an Apple iPad , they aren’t too hesitant to buy an Amazon Kindle starting at just $139.